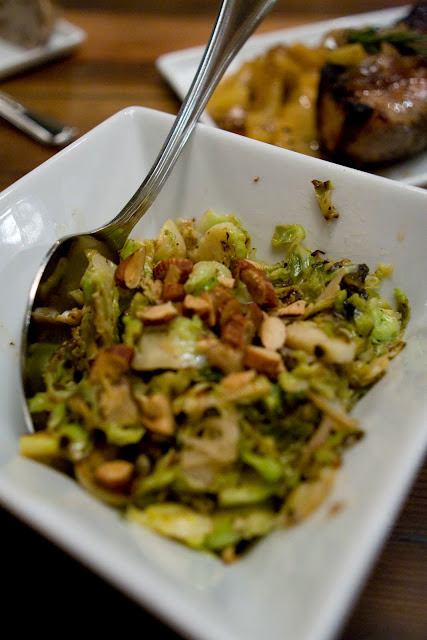 We will be closed for lunch on New Years day but open for dinner so come on in. Here’s a video for you to watch in case you wanted to see how much fun we had last year on New Years Eve. 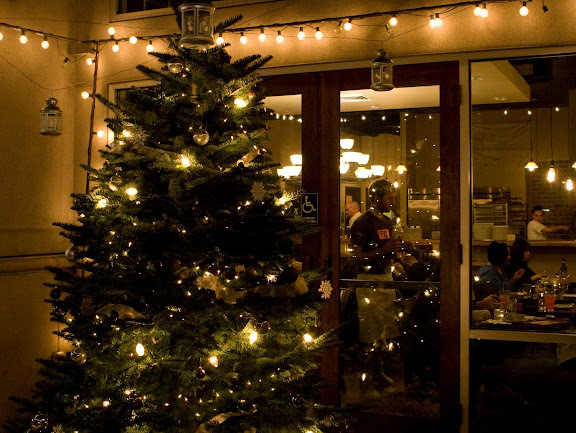 We hope to see you at one of our New Years dinners this year.. Happy holidays! We hope everyone has a great Christmas with your families. Thanks for all your love and support. We figure at either place you will be looking to spend 2 – 2 1/2 hours. We want to get you back out in plenty of time to continue the evenings festivities. Reservationists are standing by, ready to make all of your holiday wishes come true. We will be closed December 24th through December 28th for the Holidays. We will reopen Tuesday December 29th for our normal hours. 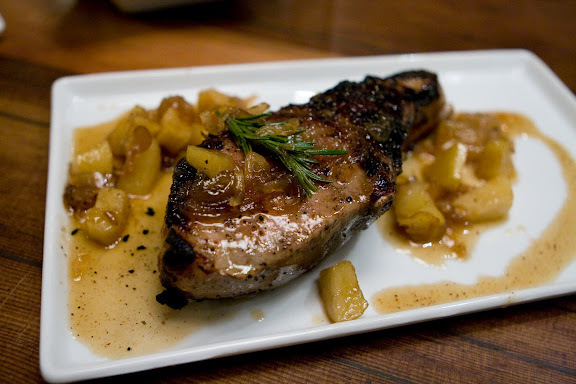 Niman Ranch pork chop. Maple vinaigrette and apples. Here is our newest dessert. 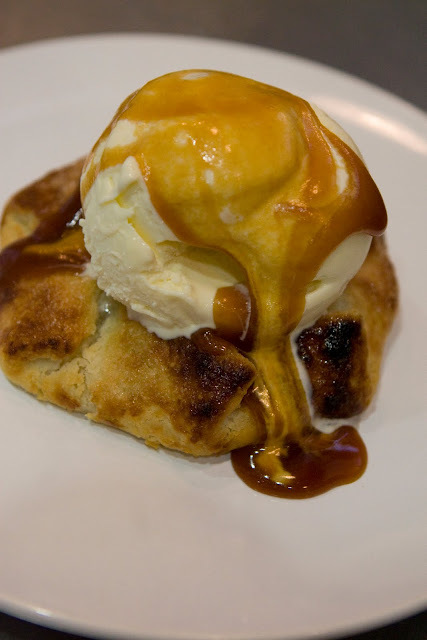 Pear crostada, ice cream, caramel. Some would say it’s a sweet treat. Combine milk, cream, vanilla and sugar on low heat. 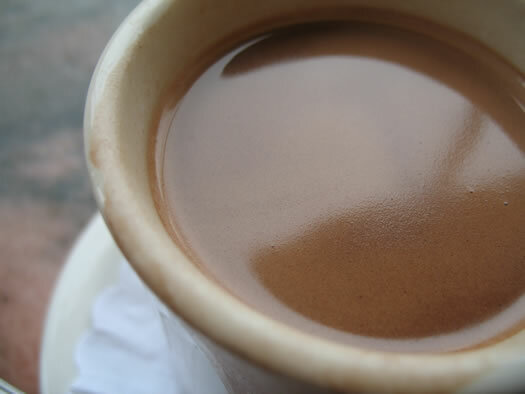 Whisk in cocoa. Add chocolate and stir until smooth. Serve with a dollop of whipped cream and your favorite cookies. In case you don’t live close and can’t come in to try our new dessert, here’s the recipe. Melt butter and chocolate together and stir until smooth. Beat yolks, eggs and sugar into a ribbon like consistency. Slowly beat chocolate into egg and sugar mixture until smooth. Then slowly stir in flour and cocoa. Do not over mix. 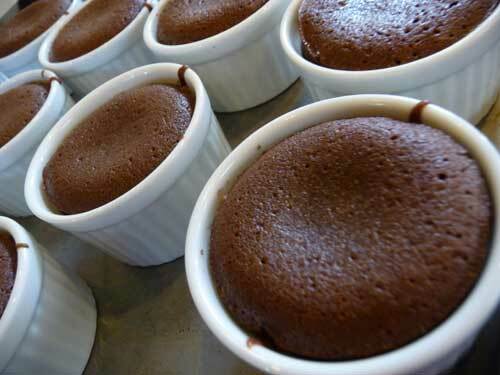 Divide into 4 to 6 ounce buttered ramekins and cool at least 2 hours. Bake at 425 degrees for 8 to 10 minutes. Serve immediately with vanilla ice cream and chocolate sauce. Makes 24 cakes. We hope everyone had a great day eating wonderful food with their families. Unfortunately there are those who don’t have a home or family or food. Click here to give to those in need during this holiday season.